In the Northern Hemisphere navigators have used the North star to guide us at night for hundreds of years. Its easy to find even on a slightly cloudy night and easy to navigate with. If you keep this star on your left, you are traveling East and if it is on your right you are traveling West. Go towards it and that’s North and away is of course South. In the Southern Hemisphere it is just as easy as we have the Southern Cross and the South Celestial Pole around which all the stars will appear to rotate from our perspective here on earth. Directly below the South Celestial Pole on our horizon is south. So now you can follow the same principal as with the North Star except that it’s the reverse. Keep to its left and you are traveling West, To the right and you are traveling East and of course go towards it for South and away for North. So, all you have to do is find the South Celestial Pole. This is where the Southern Cross comes in. It will guide you to the pole. To find it, look for two really bright stars in the night sky and draw a line from them to your right and you will find the top of the cross. You may only see 3 stars on some cloudy nights but practice and on some clear nights you can actually see 5 stars. 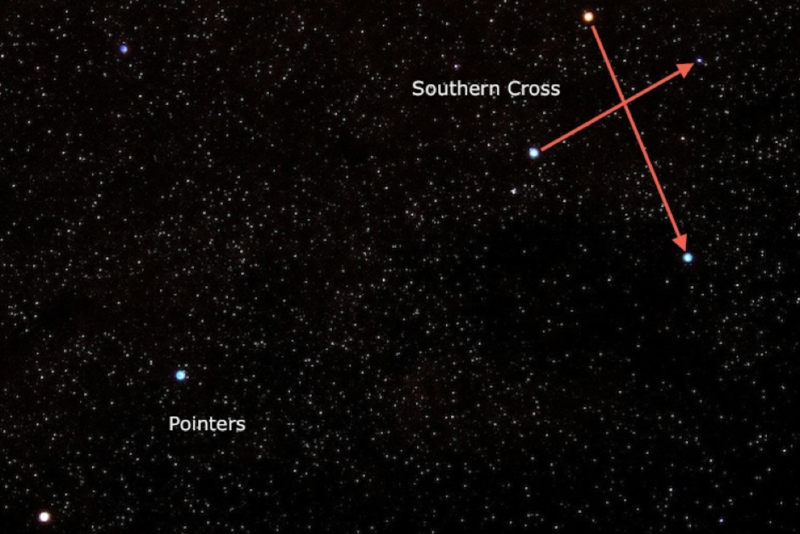 Remember that the Southern Cross will rotate around the Southern Celestial Pole and so it will be in a different place at various time on the same night, but it will still always guide you to the south. Draw an imaginary line from the top of the cross down through the bottom of the cross and continue the line about 4.5 times the length of the cross. This point is the South Celestial Pole and now you can drop a line down to the horizon and find a landmark to indicate south from where you are.